Growing up in Grand Forks, North Dakota, there was one thing about each hockey season that Judd Caulfield couldn’t wait for: heading to Ralph Engelstad Arena to watch the University of North Dakota. 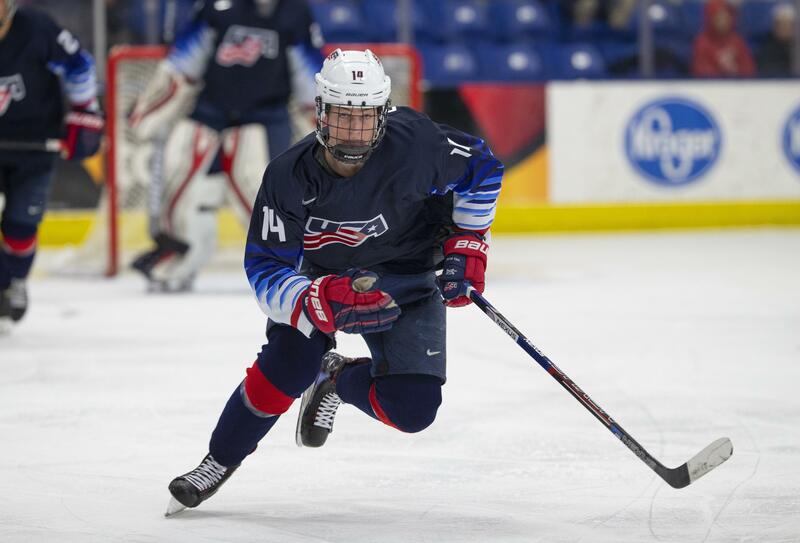 For Caulfield, he was able to get the experience of a lifetime this season when he got the chance to play at “The Ralph” as a member of USA Hockey’s National Team Development Program. Despite dropping a 6-2 decision on Dec. 29, he enjoyed his experience and is looking forward to next year, when he’ll be wearing a Fighting Hawks sweater. “It was great,” said Caulfield. “They welcomed me with open arms — I didn’t get any boos which was nice. I’m looking forward to next season and going in and playing before their fans. They always draw a huge crowd there. It will be a great experience. More than anything, Caulfield is looking forward to playing at home next season in front of his family and friends. Plus, he knows how much playing the college schedule this season will help him next year when he arrives in Grand Forks. This could be a big reason why Caulfield has already noticed a huge difference between his first season with the NTDP and this year. He credits the program for a big part in the growth of his game. “I think I have been adapting to the speed and pace of the game, better than last year,” he said. “It has helped a lot in practice, especially playing with the guys. Caulfield, who has tallied 12 goals and 35 points this season, knows that he always has work to do to make his game better. “I want to improve my scoring touch. That will come with skill practice,” he said. One of the big lessons the 6-foot-3, 207-pound forward has been learning is how best to use his body to become a big, physical power forward. It is all about fine-tuning his skills. It’s a real honor getting to represent the USA. Not every kid gets a chance to do that so I’m trying to make the most of my time, and hopefully I will get a chance to do it again in the future. He takes to heart some simple advice from the Under-18 coaching staff — John Wroblewski, Dan Hinote and Kevin Lind. Right now, Caulfield is focusing on his final few weeks in a Team USA jersey, including the team’s final league home game on Saturday, March 30, against the Youngstown Phantoms. He knows that the U18s have some work left to do to prepare for the final event — the 2018 International Ice Hockey Federation Under-18 World Championship in Sweden. It should come as no surprise that wearing the colors of his country has meant the world to him. 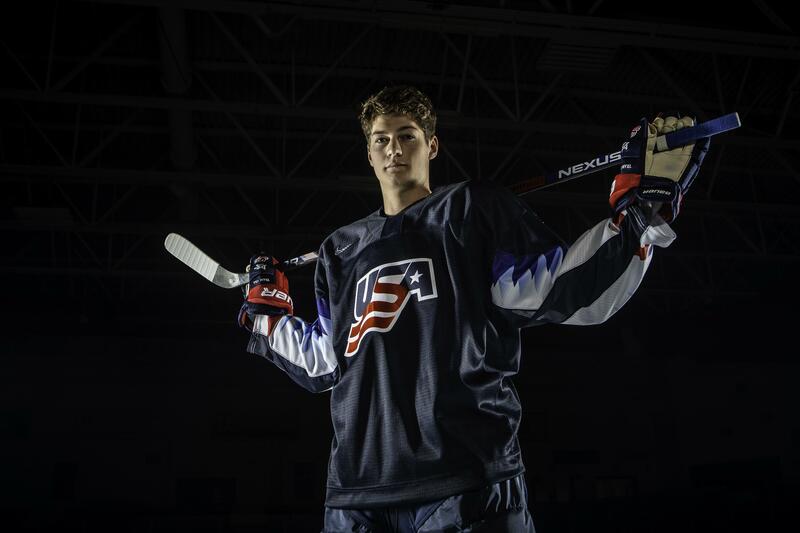 As he knows his time is coming to a close with the NTDP, there is one small thing that he wants to remember for his two years with the program. “I want to be remembered as a winner and go out with a gold medal in the end,” he said.